While tinkering and making I often watch movies. I'm not entirely engrossed in what is playing, but they provide a bit of pleasant background chatter and give me a sense of time. If it weren't for the endings I would lose myself entirely in my making and forget to stretch at lunch time and make dinner at the end of the day. One of the films I watch frequently is "Stardust". It's not actually one of my most favourite films but, for some reason, it always results in incredible productivity. Who am I to argue with results? One of the things I DO like in the film are the Sky Pirates. What a magnificent idea! A band of cloud rovers collecting lightening. 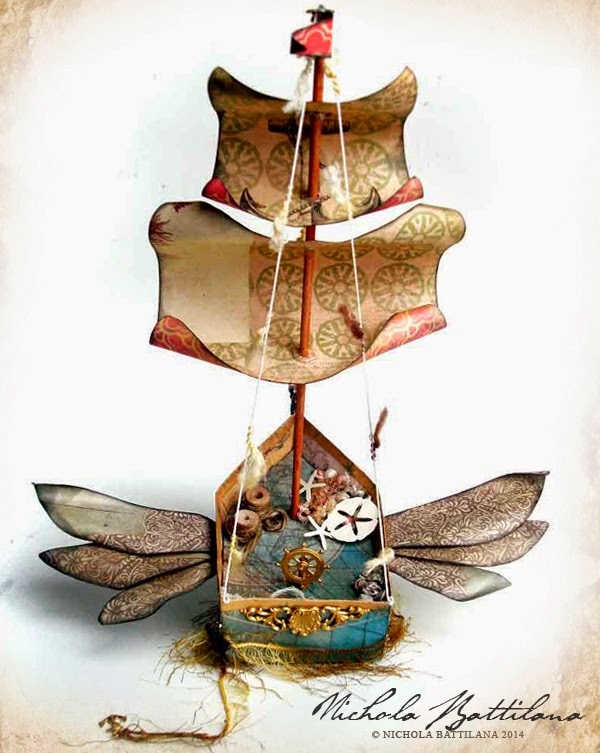 The papers in this months Alpha Stamps kit: Vintage Voyage inspired me to create my own version of a Sky Pirate ship. I'm hoping to make several in varrying sizes, an entire fleet, to suspend from the ceiling in my studio. 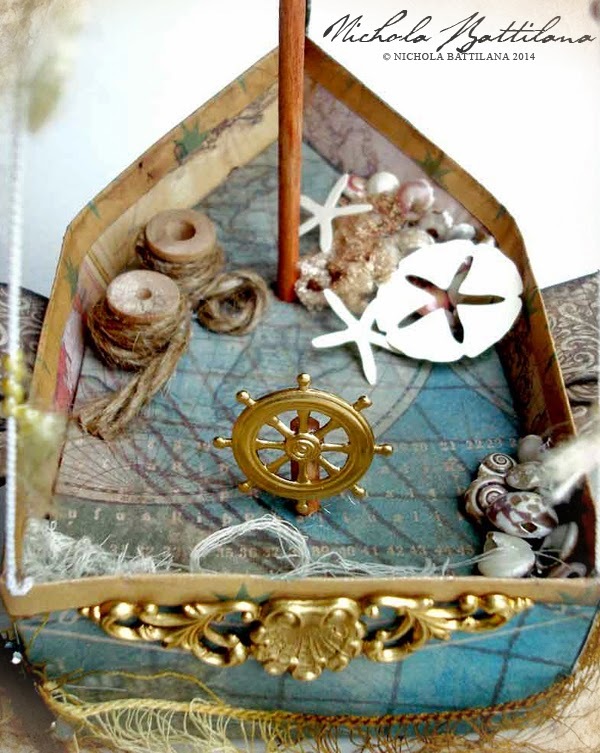 Those beautiful little Brass Anchor Charms and Brass Ship Wheel give the perfect finishing touches. A bit of jute twine wrapped around Wood Mini Spools are the perfect on-deck accessory. 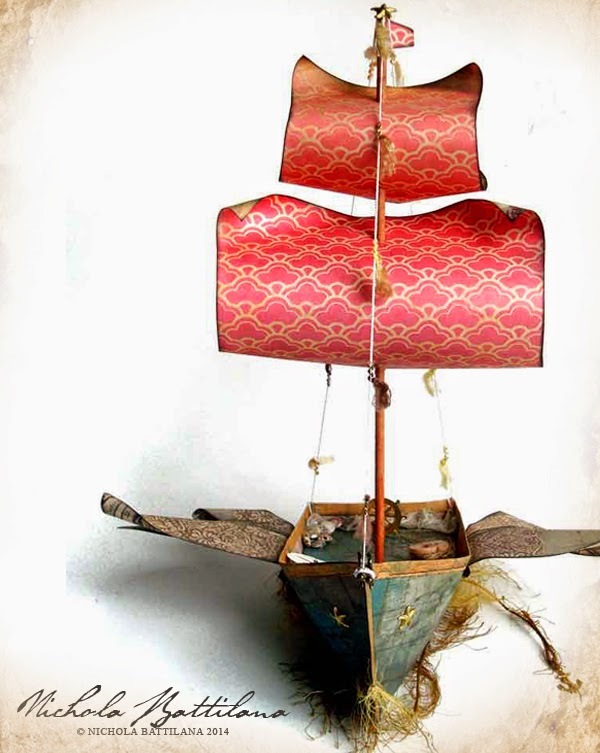 The 1/8 Inch Wooden Dowels provide an excellent mast for hoisting paper sails. The lovely curvy sails are my favourite part of this little boat. I'd love to make another with three times as many! This is fabulous! I love the idea of a whole fleet hanging from your ceiling! I have always loved the idea of sailing ships sailing through the sky and the Aether, whether freely or suspended from balloons. This is a lovely realization of such a dream. The deck details and the flow of the sails are marvelous. Amazing! The shapes and details you created with paper are beautiful. 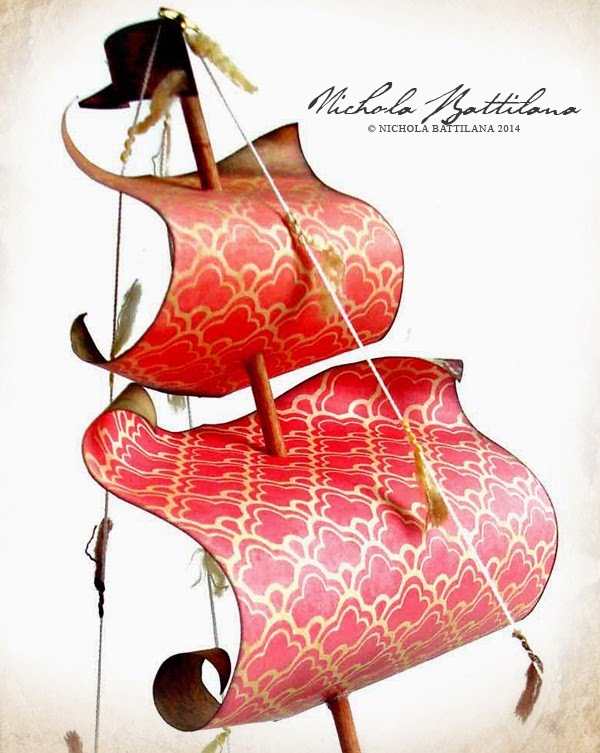 Amazing job - how did you make the boat itself? I hope you will make a tutorial on this, as I would enjoy making some for myself. It is gorgeous. Ohhhh I am in love with this little ship!! I have never seen the movie but it immediately brought to mind one of my favorite fantasy books "Last of the Sky Pirates" from the Edge Chronicles. Yes, flying ships and wonderful worlds. 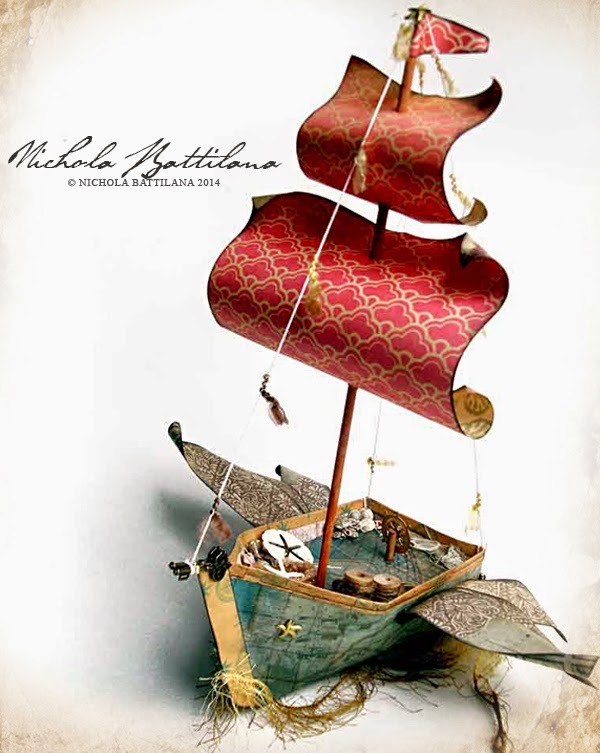 . . this is truly beautifully detailed and imagined Nichola! This is the most amazing thing I have every seen. You are very talented. Incredible Nichola! I was blown away when I saw it this morning. Truly a fantastic creation. I really love this. Please, please, please can you do a tutorial on how you made this as I would love to make one myself...pretty please..
As I have said before your talent is endless. I have the soundtrack to "Stardust" and love to listen to it in the studio. Such an awesome creation! Love the idea and a terrific inspiration. Thanks for sharing and hope you'll offer a tutorial.